Portray Advertising is the winner of the Most Promising Startup of the Year Award, presented by KPMG Enterprise at the annual NACO National Angel Summit. The Winnipeg-based company competed against 15 other startups for this prestigious award after a day of pitching and a final five-pitch competition. The judging panel was made up of Angel investors and venture capitalists. 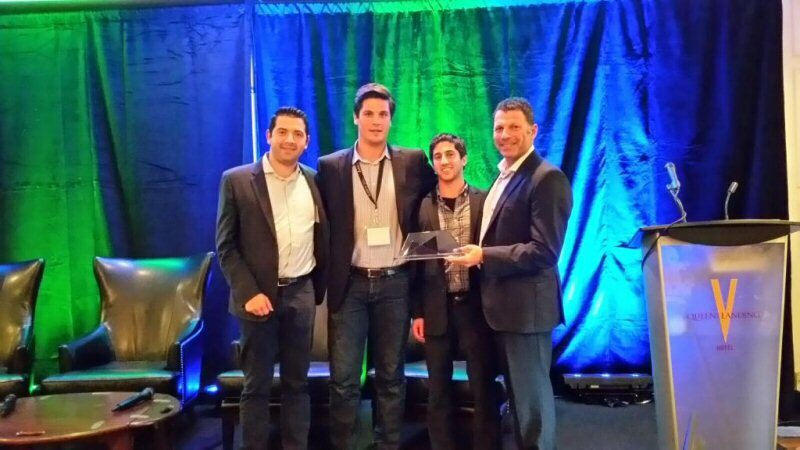 "It's extremely humbling to be presented with NACO's Most Promising Startup of the Year Award. NACO put together an incredible group of startups and we are just honoured to be apart of it, said Kyle Boult, Managing Partner of Portray Advertising. "The entrepreneurial experience has had so many ups and downs for us we are really going to try to savour this moment for awhile." Portray Advertising has developed a proprietary transparent cafeteria food tray that allows retailers, brands and organizations to insert relevant communications in the interior. "We have met a lot of people at the National Angel Summit who can take Portray Advertising to the next level. The amount of networking we have been able to do in the last two days is staggering," commented Greg Lipschitz, Managing Partner of Portray Advertising. It was a close pitch competition and judges gave a honourable mention to Eve Medical. "This year's startups were all looking to impress our attendees so that they could secure their next level of funding to fuel the scaling up of their ventures. With over 350 Angel investors watching their presentations, it was a great opportunity to showcase Canada's best. While all the companies were worthy of investment, Portray Advertising was singled as best in class by our investors and expert judges," said Yuri Navarro, Executive Director National Angel Capital Organization. "They are walking away with the top honours and it is well deserved." KPMG Enterprise supported the award and helped with the voting process at the NACO National Angel Summit. "It is always exciting to see innovative companies pitch in this national competition - a big congratulations to Portray Advertising," said Rakan Aown, VP Business Development at KPMG Enterprise. "KPMG Enterprise is honoured to help support the thriving startup ecosystem across Canada through this important program." More than 350 Angels from across Canada attended the annual NACO Summit in Niagara-on-the-Lake. SurfEasy was awarded NACO's Exit of the Year Award. Blake Laufer, from Angel One Network accepted the award with SurfEasy's CEO Chris Houston. "Blake worked with SurfEasy to negotiate the valuation and the structure of the investment; this was a little contentious but came to a successful resolution," said Karen Grant from Angel One Network. "Blake led the round of investment with contributors from Angel One, the Georgian Angel group and the Niagara Angels. In total there were 13 investors across the three Angel groups with a combined investment of $515,000. Blake established a "voting trust" do keep the investors in lock-step so they could act as a bloc rather than individually." Launched in 2015, NACO's Exit of the Year Award is being presented by the Royal Bank of Canada. It recognizes the most successful exit achieved by a Canadian startup that received financing by one of NACO's member Angel groups. The award seeks to recognize the partnership between an individual Angel investor and a founder that most contributed to the growth and eventual exit of the said startup through a combination of investment(s), mentorship and leadership. The National Angel Capital Organization accelerates a thriving, early-stage investing ecosystem in Canada by connecting individuals, groups, and other partners that support Angel-stage investing. NACO provides intelligence, tools and resources for its members; facilitates key connections across networks, borders and industries; and helps to inform policy affecting the Angel asset-class. For more information please visit www.nacocanada.com or follow them on Twitter @AngelCapCanada. Portray Advertising has developed a proprietary transparent cafeteria food tray that allows retailers, brands and organizations to insert relevant communications in the interior. The ads are protected from the adverse environment of a commercial dishwasher. We place our food trays in food courts in Shopping Centres to give marketers access to this highly sought after environment. For more information please visit www.portrayadvertising.com or follow them on Twitter @PortrayAds.